Extending the government’s Digital India vision to the grassroots level, Intel India today announced the completion of their digital learning centers, better known as Unnati Kendras, in 100 towns across India. 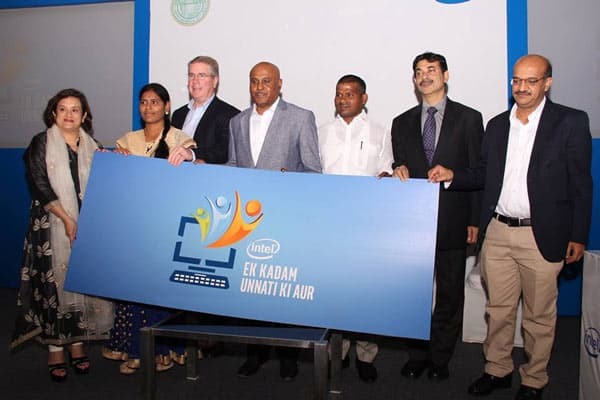 Under the Ek Kadam Unnati Ki Aur initiative, Intel India, in collaboration with CSC e-Governance Services India Ltd, had created a blueprint for the digitization of non-urban India. Through a network of 100 Unnati Kendras deployed at Common Service Centers, the company has made the experience of personal computing real for more than 250,000 local citizens till date. Under a public-private collaboration with state governments, Intel India has been driving the relevance of personal computing through a differentiated approach that strikes a balance between hardware, software, solutions, and training. The 100 Unnati Kendras that were inaugurated earlier this year are on-ground facilities serving as common access digital learning centers for local citizens, with a focus on education, entrepreneurship and innovation. Each center is equipped with Intel® powered devices, vernacular language content, and relevant training programs for local citizens in the state, creating opportunities for skill development and digital empowerment. Since the launch of the first center in April 2016, Intel India has seen an average of 47 citizens entering each Unnati Kendra per day, and of these, 18 requested demos in basic PC skills. According to Intel data, 44% of the walk-ins wanted to use computers to access e-learning and educational content, with 28% aspiring to use computers for creative self-expression, and 28% for entrepreneurial activities . 33% of this universe were students and youth between 18 and 25 years old and 22% were women , who are the early adopters and change agents in these new markets. The Ek Kadam Unnati Ki Aur initiative has enabled Intel India garner deep insights into what non-urban consumers seek from technology and how to leverage technology to close the last mile digital divide. According to the user insights from the centers, the top PC-based activities have been video-based computer training, understanding e-commerce, browsing detailed information on government policies, e-mail and applying for jobs on job portals. Village Level Entrepreneurs (VLE) in charge of the centers are taking on the mantle of Unnati Gurus or local knowledge bearers of technology, who are responsible for demonstrating the basics of PC usage to walk-ins on Darpan, a multilingual user interface which comes in six regional languages. These trained personnel are conducting daily in-depth sessions on digital literacy, computer skills and internet facilities, along with dedicated guidance sessions in entrepreneurship, language and vocational training to improve the educational and employment prospects for local citizens. The 100 centers in Tier II, III, IV and V towns are in operation across 11 states pan-India; Telangana (14 centers), Uttar Pradesh (14), Andhra Pradesh (13), Haryana (11), Maharashtra (11), Tamil Nadu (10), Karnataka (7), Gujarat (6), Assam (5), Chhattisgarh (5), and Kerala (4). The centers are also being used as platforms for the delivery of last mile digital services and government related information about Digital Literacy, Financial Inclusion, and Healthcare, for the benefit of local citizens.